The first rule of casting club is this: make sure the actors look at least remotely like the characters. Frozone: Wait a second, what's this? Is that me? I'm white! They made me a white guy? Frozone: They made me a white guy! — The Incredibles, talking about a cartoon show starring Frozone and Mr. Incredible. 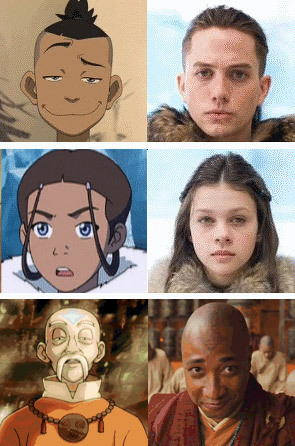 A Race Lift is what occurs when a character's race or ethnicity is changed in the creation of a derivative work, also known as Racebending, and in the case of non-white characters becoming white, whitewashing. Sometimes this is a method to try and keep things politically correct. People can't argue racism if you have a Token Minority in the cast, but you usually run into problems when you change a character who is originally a proud minority into a member of the majority group. Diversifying a Cast: Changing the ethnicity of minor characters to prevent the entire production from being homogeneous. Changing the Minority: A character who was a minority being made into a majority. Changing the Majority: A character who was a majority being made into a minority. Minority to other Minority: Switching around ethnicity to other minorities. Uncertain Depictions: The exact race of the individual was in question to begin with, especially in the case of historical figures. Mixed Race/Miscellaneous: Characters and actors who are ambiguous to begin with and thus are interpreted differently. If a character in a work changes their race within the storyline, it's Black Like Me (if it's voluntary) or Color Me Black (if it's involuntary). See Blackface, Yellowface, and Brownface when the actor uses makeup to perform as a character of a different race. See also: Colorblind Casting, Black Vikings, Five-Token Band, Twofer Token Minority, Mukokuseki, Gender Flip, Affirmative Action Legacy, Adaptational Nationality, Adaptation Species Change. Often involves an Adaptation Dye-Job. See Gender Flip when an adaptation changes a character's gender instead of race. See Divine Race Lift when gods are portrayed as a race different from their traditional representations. See Fake Nationality when a character's ethnicity is meant to stay the same, but the person playing him doesn't have the same background. This has also been known to result from Ability over Appearance, when the character's race is changed because the ideal actor fits the role in everything but their looks.